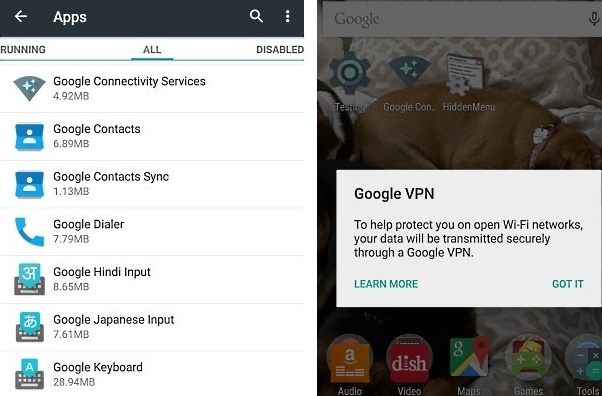 Home > News > Google VPN in Android 5.1? The latest Android 5.1 build on Nexus 6 has been found with interesting new system application called “Google Connectivity Services” which include traces of Google’s own VPN service. Back in January, it was reported that Google was in talks with Sprint and T-Mobile to launch an MVNO service, which the company confirmed recently. Now, the latest buzz is that Google might provide VPN access to Android users who connect to public WiFi networks. On successful launch the app showed up the “Google VPN” alert. According to this alert message, Google VPN is supposed to protect the users when connecting to a public WiFi network. However, at the moment the service is non-existent and is probably an app that was pushed into the final build before time. Clicking “Got it” takes you to the standard VPN connection request screen where connections can be done. Unfortunately, it’s not possible to actually connect to any VPN, using an open WiFi network, a secured WiFi network, or LTE. It’s unclear when Google will launch this feature, whether it will be open to everyone or just certain types of users, or if Google might discontinue it, like it did with App Opps. With the amount of information we already have about Google’s wireless network plans for its Nexus users, it is quite possible that this service might also be one of the benefits of getting a Nexus device, but we can only know if the company gives more details regarding it.